Born in the year 1936, Venu had his basic schooling at Trichur.Passing out as an Engineer from P.S.G College of Engineering, Venu served in different designations in many reputed companies before retiring as Chief Engineer of Co-operative Sugars, Menonpara. He is married to Ambat Hema. They have only one son, Manoj Ambat ( Manoj) who is currently practicing as a Lawyer at Palakkad. Born in the year 1938, Aniyan had his basic studies at Trichur. Aniyan is an agriculturist by profession. He has married Padmam and they are settled at Trichur. Their only son Anup (Anu ) was born in the year 1974. After completing his early schooling from Chittur, Anup did his graduation from Trichur.He also completed advanced courses in Computing and had worked in different capacities in many reputed companies in Banglore. He is currently employed at UAE. Anup is married to Seema.Seema is currently employed in UAE with a Reputed Airlines.They are blessed with a boy, Akshaj born on 24'th of December, 2008. Sreekala was born in the year 1961.A noted dancer, Sreekala started studing dance at an early age. An acknowledged dancer, Sreekala has given dance performances in Kerala and in many of the reputed festivals through out India.Sreekala used to run a dance school at Trichur by the name of Ananya Kala Kendra. Sreekala is married to Dr Arun Kishore,a noted Psycatist of international repute.Arun is now working as a Consultant Psycatist at Worthing, Sussex, United Kingdom. They have only one daughter, Ananya who is herself a good dancer.Ananya now studies at Worthing, Sussex, United Kingdom. Mridula was born in the year 1968.A dancer of National repute, Mridula started her training in various South Indian dance forms at an early age. She has performed all over India. She is married to Sri Nandakishore Varma, who was working as an Engineer at FACT, Ernakulam.Later,they shifted to Bahrain.Now Nandakishore Varma is working at Abudhabi, UAE. Their only son Anang was born on 7'th of July,2001. Born in year 1942,Sarasam started her dance training at an early age. She was married to Sri Purushothaman Nedungadi who retired as General Manager from Mahendra & Mahendra. He was also an Acknowledged scholar, noted Film critic ( he used to write films under the pen name "Nadir Shah" ) ,also an authority in History, Literature. He was the former Director of Bharatiya Vidya Bhavan's School of Journalism. Purushothaman Nedungadi passed away in the year 1998.They have two daughters. Tamara was born in the year 1968.An acknowledged director, she was the force behind such successful teleserials like "Swabhiman and Kitty Party". She is married to Vinod Ranganath, who is an accomplished Scriptwriter. He has such successful films as "Mast" to his credit. He is also the script writer for popular serials including "Kitty Party" among others. Their only daughter Sharmishtha was born on 20'th of May,2001. Lopamudra was born in the 1978.After completing her graduation from Providence College, Calicut Lopa did her PG Diploma in Travel & Tourism and has completed her I.A.T.A. She is married to Harish Palat who is employed in London,England. Lopa now resides in London and works with a travel agency.They have been blessed with a baby daughter Avanthika, who was born on 15.07.2008 at Calicut. Born in the year 1948,Rajeswari completed her MBBS from Calicut Medical College. She started her carrier as a Medical Practioner from Trichur. Married to Dr T. M Sarvothaman Nedungadi. They worked for many years abroad in many countries including Kenya. Rajeswari is now working at P.V.S Hospital, Calicut as Consultant Gynaecologist. 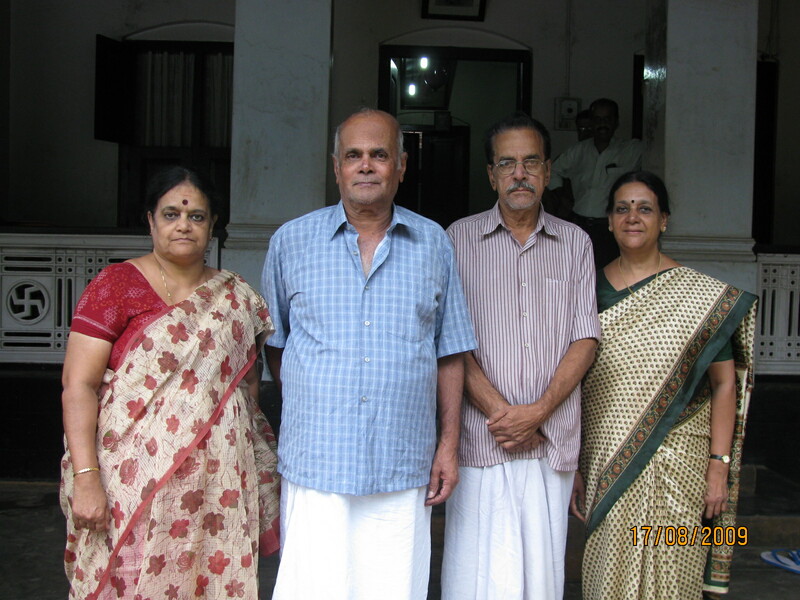 Dr T. M Sarvothaman Nedungadi retired from the Calicut Medical College. He is now the Head of Dept of Surgery, M.E.S Medical College, Perinthalmanna.